This is classic New Apostolic Reformation heresy on the Kingdom of God (basileiology) and (eschatology) brainwashing youth at Bethel. For instance, ‘global expansion of God’s kingdom, through His manifest presence’ is the NAR agenda, this concept taken from a misreading of Habakkuk 2:14 and Rev 11:15. It’s interesting to note that Hillsong only become advocates of the New Apostolic Reformation whenever they believe it ‘safe’ to do so. After the abusive treatment of women in their ‘Mercy Ministries’ and the Michael Guglielmucci scandal was exposed, they have done their best to repackage and normalise their controversial NAR doctrines around the world. In 2013 Hillsong revealed their dominionist agenda in the ‘This is Revival’ advertising campaign leading up to Hillsong Conference 2013 (full article republished below). I had so much fun on Sunday preaching and pastoring. I felt the Holy Spirit say, “take the revival to the very back of the room” so that’s what I did. Why is he starting with this revival talk now? Could it be because of ‘Awakening Australia’? The recent ‘revival’ that the Bethel cult brought to Australia towards the end of last year, had many of its Australian ‘apostolic’ associates endorse it. 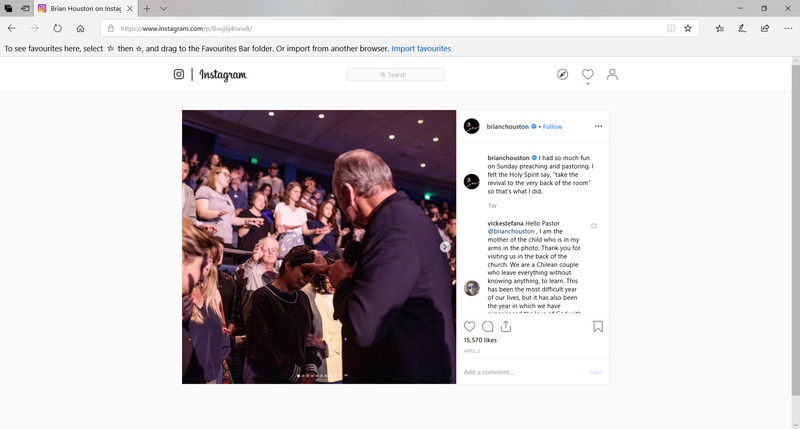 With all the talk of ‘revival’, could it be that Brian Houston also wants to be seen as an important spiritual ‘spearhead’ as well – aggressively retaking dominion in Australia by ‘advancing’ the (Hillsong) kingdom (particularly since we don’t find Hillsong associated with ‘Awakening Australia’)? Anyone who has left the NAR will be very familiar with these ‘dominionist’ code words. vickestefana Hello Pastor @brianchouston, I am the mother of the child who is in my arms in the photo. Thank you for visiting us in the back of the church. We are a Chilean couple who leave everything without knowing anything, to learn. This has been the most difficult year of our lives, but it has also been the year in which we have experienced the love of God with the church. We have come a long way and we know who we have believed in! brianchouston @vickestefana So nice to hear from you. I believe with you that God has great days ahead for you. How does he know this? A biblical pastor should not say this. But an NAR Apostle or Prophet likes to give the impression that God speaks to them directly. This man is a wolf preying on this poor soul. A godly pastor would simply pray for them, asking for God’s will to be made manifest in their lives. Note Brian did not do this, rather he’s given a false prophecy. Jesus makes it clear that men like Brian Houston are false prophets and we are to have nothing to do with them (Matthew 7:21-23). Why would God the Holy Spirit tell Brian Houston to take ‘revival ‘ to anyone? If God was to speak to Brian Houston (as He does through His Word), God would tell him to repent of his deceitful words and ministry (as He has through His Word). We end with our article on the ‘This is Revival’ article back in 2013 from Hillsong Church Watch. The language that accompanies their ‘revival’ talk highlights the same dangerous dominionist agenda that we are hearing from Bethel and C. Peter Wagner. ‹ A manifesto for the discerning Christian.